When drivers are traveling at higher speeds, there is a greater chance of accidents happening and there is an increased likelihood an auto accident will be a fatal one. A recent Portland car accident illustrates the tragic consequences which can occur as a result of drivers going too fast. KATU reported on a high-speed accident which resulted in the death of a teen pedestrian. The accident happened when the teenager was crossing Southeast Hawthorne Boulevard at approximately 4:00 PM. She was hit by a gold Lexus, which was driven by a 20-year-old motorist. The Lexus reportedly approach 43rd avenue and was in the center lane, rapidly going past other vehicles. The driver of the Lexus apparently came close to hitting other cars, according to witnesses who saw the accident happen. The driver was traveling approximately 60 miles per hour when he struck the teenager who was crossing the street. Although the teenager was killed by the auto accident, the driver of the Lexus did not stop right away. He continued to travel west on Hawthorne at a high speed. He did, however, eventually return to the scene of the collision. A witness at the crash scene administered CPR to the teenager who was hit by the vehicle. The witness told KATU the victim was only 15-years-old. She had left a coffee shop and was reportedly trying to get to the north end of Hawthorne. Her mother was with her, and was reportedly standing just a few feet away from her at the time when she was killed. The driver who hit her was driving on a suspended license, and he was arrested at the scene of the collision for reckless driving, hit and run, and manslaughter. Unfortunately, this crash is one of many which occurs because of drivers who choose to recklessly speed. When a driver goes too fast, he significantly increases the chance of getting into an accident and he also increases the likely severity of the accident. 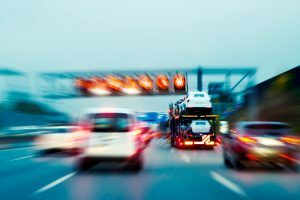 Automotive Fleet has reported on the risks associated with excessive speed. While the average driver has about a five percent chance of becoming involved in a car accident, each percent increase in speed results in a two percent increase in the driver getting into a crash. Drivers who speed may lose control of cars and have a longer stopping distance, which helps to explain the added crash risks. When accidents happen at faster speeds, the crash forces multiply, increasing the risk for serious injuries and fatalities. A one percent increase in speed transfers to a three percent increase in serious injuries occurring if the speeding car crashes and translates into a four percent increase in the chances the accident will be fatal. Drivers should be aware of the tremendous risks and should make it a point to travel at or below speed limits so they are always traveling at a speed which is safe for the current conditions of the road.